1 | 36 students enrolled. Finance for Non-Finance Managers course cuts through complex financial information. This course explains in simple terms the principles of finance and can be easily comprehended by any non- finance background. The interactive and practical sessions are designed to provide a thorough working knowledge of critical financial concepts. For good decision capabilities in an organization, it is imperative, that an individual has a good understanding of the financial statement analysis. Be it any dept. like Sales, Purchases, Acquiring Assets, Raising loans, etc., one cannot afford to be ignorant of Finance Management. Lack of adequate financial knowledge may turn out to be a costly and business may not even exist to repent about it. Hence, it is vital for all the entrepreneurs and important personnel of departments to have fair knowledge of Financial Management Theory and Practice. 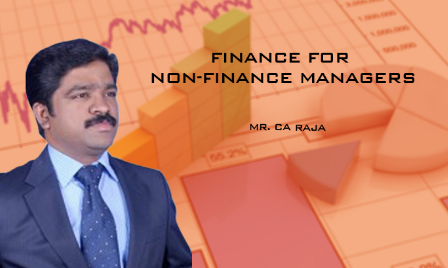 This course on 'Finance for Non -Finance Managers - A Complete Course' will help you understand the logic behind the need for 'Effective Finance Management for Organizational Betterment', hence assimilate business financial data in the most effective manner. Finance for Non -Finance Managers course has been designed for those intending participants who do not have any knowledge in Accounting and Finance. Hence, the course starts with the fundamentals of financial management and does not mandate any requirements.